"Are you a junk foodie? Health foodie? Fingerfood foodie? We have a day for you!!! 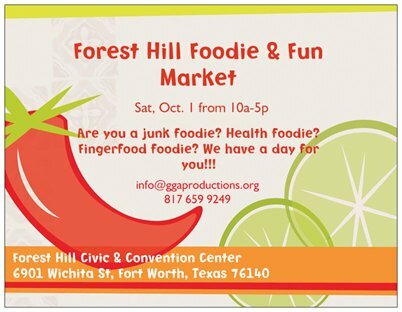 Forest Hill Foodie & Fun Market, Sat, Oct. 1, from 10 am to 5 pm at the Forest Hill Civic & Convention Center. Booth after booth of food!!! Salsas, jams, jellies, BBQ...sample some great food offerings!!! There will also be some arts/crafts, boutiques, jewelry and more!!! Admission is free w/a canned food donation of 2+ cans per person to benefit the Golden Food Pantry, or $2 per person without a food donation. Kids 12 and under are free with paid adult." Admission is free w/a canned food donation of 2+ cans per person to benefit the Golden Food Pantry, or $2 per person without a food donation. "Commerce Street Night Market brings together local vendors, musicians, artists, and performers on the last Friday of each month beginning in June. Come be a part of the vibrancy of West Dallas. Shop local, enjoy great food & beer, participate in pop-up classes, and be entertained into the night!" "Birdville High School's 18th annual Craft Fair and Silent Auction is scheduled for Saturday, October 1 from 9:00AM to 5:00PM this year. There will be over 130 returning and more new vendors joining every year. We had record shopper attendance last year with over 1300 shoppers attending this one-day event. The Silent Auction was a huge success and allowed our shoppers to preview the selection in the Craft Fair. Vendor applications are available on our website at www.birdvillehighptsa.org or via e mail to birdvilleptsa@gmail.com. This well-attended Craft Fair is heavily advertised and supported by the Birdville community and funds over 6 scholarships for graduating seniors as well as teacher grants to supplement classroom equipment. Join us this year and see your sales explode!" Admission Fee: We ask for a $1.00 donation to help support Birdville Project Celebration but it is not required to attend the event as a shopper. "C & C Academy of Dance is hosting its craft fair on October 1, 2016. This fundraiser will help our company team collect money for the 2017 dance year. Our girls are working extra hard this year and want a chance to get to Nationals in July!" "Held the first Saturday in October, the Denison FallFest is a fun-filled action packed day for the entire family in Downtown Denison. A pancake breakfast complete with bacon & sausage starts the day in Heritage Park. Arts & Crafts booths fill Main Street while food vendors delight shoppers with yummy festival food. Games and carnival rides entertain the kids from one end of Main Street to the other. To keep the mood light, music fills the air at Heritage Park on Main Street while shiny vintage cars fill the streets on one end of the downtown area. Activities for kids are scattered throughout the festival while parents and visitors are entertained at the Demonstration Stage Area. Hope to see you there!" 200-700 blocks of Main St.
"A street festival FREE to the public directly in the middle of the historic downtown square of Granbury, TX! Featuring ghost hunters, psychics, horror, sci-fi, fantasy, and cosplay vendors, plus much more!" "Shop over 50 local vendors! This is an excellent place to find those unique gifts. Come join us and support local vendors as well as Plano’s award winning choral department." At the corner of W Park Blvd. & Independence Pkwy. "Pet centric event with FTW PD K9 demo, petting zoo, dunking booth, food trucks, contests, pet portrait opportunities. Broadly promoted." "This is our 1st Annual North Forney Homecoming Extravaganza! Join us for fun, food, vendors, entertainment, car show, and the Tony Jackson Memorial Scholarship Walk-a-Thon!"